Thursday after school is art day around here. A surprisingly good-natured college student attempts to teach a room full of noisy messy chatty silly 9-year-old girls how to draw. Which is fun for all of us, but most of my time is spent trying to quiet them down enough for the young woman to teach, sweeping up crumbs and popcorn, telling the dog to stop barking and wiping down walls where mysterious smears appear from charcoal coated hands. So this was a simple and inexpensive alternative to going out to eat last night. I think the prep took about ten minutes and the cooking time was about the same. 2. Meanwhile, Cut the pork into bite size strips. In an extra-large skillet heat the chili oil over medium-high heat. Add the pork and stir-fry until no longer pink. Add the garlic and ginger and cook for 30 seconds. Carefully add the chicken broth and soy sauce. Scrape the bottom of the pan while you stir. 3. Bring the broth to a boil. Add the spinach and carrot. Cook until spinach is wilted and carrot is cooked, about 3 minutes. Turn off heat. 4. Place the ramen noodles in the boiling water (throw away the flavor packets). Cook for exactly two minutes and strain. 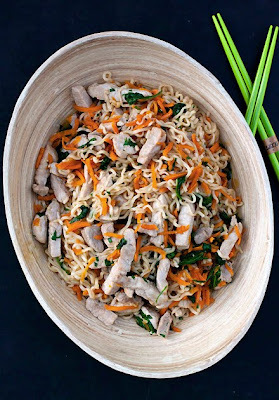 Place noodles and cilantro in with the pork mixture. Toss well and let the broth soak into the noodles for a couple of minutes. I really wish I could have art day. That sounds awesome. So does this pork noodle bowl! Yum. Mmm! I love the flavor combos used here! I've been trying to come up with good lunch options lately and this looks awesome for that!